Eco Bricks - Can We Build it? This term Foundry Lane has been learning about the mass pollution of plastics in the Earth’s oceans. During International Day, the children made fantastic projects including recycled plastic sculptures, posters made from recycled paper, and many more. Over the Christmas period, the children have been asked to make an Eco Brick. 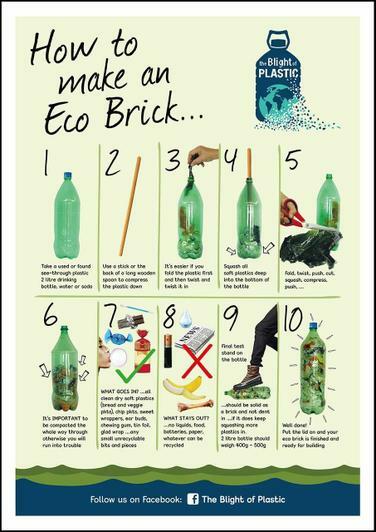 An Eco Brick, is an empty, clean plastic bottle filled with unrecyclable plastics that can be used in building projects over the UK. To clarify, children should fill their Eco Brick with plastics that aren’t recycled in Southampton currently. The bottle should be so full that is hard and cannot be crushed under your foot. The Eco Bricks will be collected on the 7th, 8th and 9th January at the start of next term. There will be a small reward for the class that bring in the most bricks, and for the children in the school who bring in the most bricks. What can go inside the Eco Brick. Some soft plastics from toy packaging, such as bubble wrap. Any soft, clean plastic that is currently not recycled by Southampton City Council. .
What cannot go in the Eco Brick. Plastics that can already be recycled.